On Thursday 7th February the BGN Family of Primary Schools took part in our second Sportshall Athletics festival this term. 56 targeted Year 3/4 children from Bishop Loveday, Orchard Fields, St. John’s, St. Joseph’s and William Morris took part. Participants completed a circuit of athletic activities in which they learnt and practised each activity before competing against each other; individually and as a team. 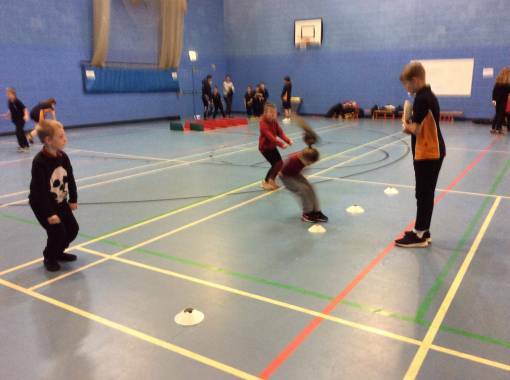 Activities included continuous and obstacle relays races, speed bounce, standing long jump, vertical jump, chest push, target throw and shuttle run. The inclusive nature of this event ensured less confident children were able to engage in and enjoy the activities in a relaxed environment. During the event, the Spirit of the Games value of ‘Determination’ was a key focus area. Two athletes from each team was selected and presented with a special certificate to recognise their positive attitude and perseverance throughout the festival. In addition the winners of each event received a certificate to recognise their achievement. Thank you also to the sixteen year 8 student leaders who took charge in leading the activities through explaining, demonstrating, measuring and scoring. For many of them this was their first leadership experience.